In software development, the primary limit on making improvements is actually the human mind. The amount of complexity a computer can handle is obviously much higher than that our brains can cope with. What’s not so obvious to non-coders is that this places limitations in the kinds of software we can write and understand, because software is currently still written by human beings. The best architectures are simple enough to encapsulate in a simple flow chart, with a few distinct elements. It’s those that would be the best guide for “programming your productivity”. Some questions to ponder, if you’re so inclined :At what point will software be written mostly by other software, with only suggestions from human operators? With our climb up the ladder of abstraction, have we already crossed that threshold?Why do we believe we must fully understand a system in order to design it? Are there not non-deterministic non-linear systems in nature? Could we trust emergent software? Let’s look at how programmatic thinking affects the core element of almost every productivity system in existence: the humble “Todo” item. In software, there is an object called a “Promise”. It allows us to specify an action, as well as what to do if that action succeeds, and if it fails. You can also chain Promises together, and only execute the next action if the previous one succeeds. In essence, Promises are an elegant way of writing flowcharts for portions of the program that you don’t know for sure will succeed. Getting something from the net, or writing something to a server are both things that might fail for any number of reasons, and are two examples of actions that are handled with promises. Why do we insist on writing todo lists as if every action on them were certain to be successful? 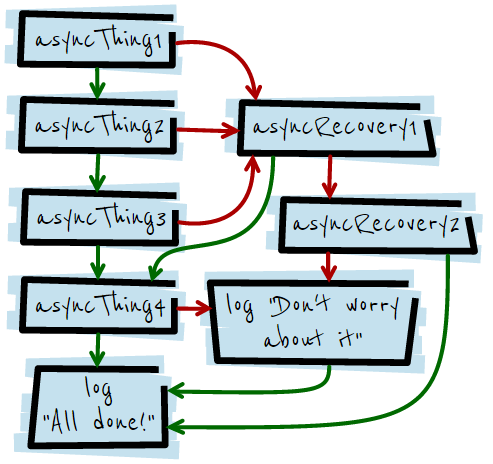 Knowing about the Promise pattern leads one to question the fundamental building block of most productivity systems. 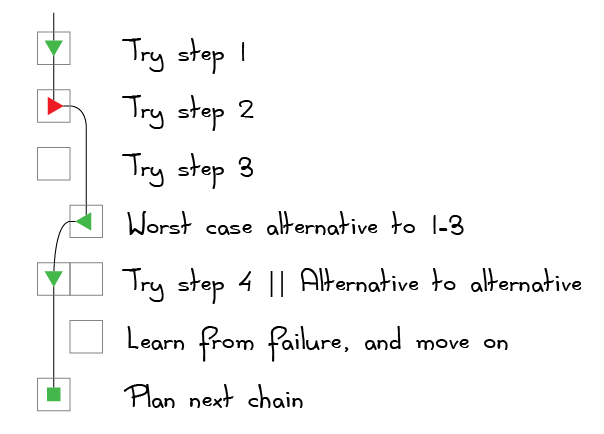 What if we were to write “Promise chains” instead of todo lists? Scenario 1: Failed at step 2, but recovered using “Worst-case alternative to 1-3”. Scenario 3 : Failed step 3, none of the alternatives worked either. Back to the drawing board. I admit, it seems a little odd. But the theory is sound. You’re taking advantage of your planning mindset, and determining not just the very next action, but as many as you can know clearly from where you are. You are able to plan for the real world, where things rarely go as planned. This approach means you always know what to do next, a key requirement for the flow state, even when things are going wrong. This fact alone makes it worth trying. “The only true voyage, is not to go into new landscapes, but to have new eyes”. It’s hard to understate the importance of learning things that are outside your current scope of knowledge. Every new lens you acquire gives you not just one new way of seeing the world; it can combine with all your other lenses and yield hundreds of new ideas. One software pattern, the “Promise”, and one “what if” has allowed me to question the atomic unit of every productivity system I’ve ever encountered. There’s much more to this lens that I’d like to explore. But it’ll have to wait till next week, since I’m trying to keep the scope of my blog posts down, and focus on quality and frequency instead.